The Petman humanoid robot is among several developed by Boston Dynamics, which Google now owns. Google just bought a fearsome fleet of robots. The company confirmed a New York Times report that it has acquired Boston Dynamics, the Massachusetts-based maker of such noted mechanical beasts as BigDog, Atlas, Petman, Cheetah, and Wildcat. The company’s robots are among the world’s most advanced two- and four-legged machines. Some are humanoid, while others resemble predatory animals. Most have been developed under contract with military agencies, including the Defense Advanced Research Projects Agency, or DARPA. What might Google want with an army of military robots? At first gasp, the answer might seem to be, “conquering the world.” But that doesn’t seem to be the goal—at least, not in a military sense. Google told the Times it will honor Boston Dynamics’ existing contracts, including a $10.8 million deal with DARPA to develop its Atlas prototype for potential humanitarian use in disasters like the Fukushima meltdown. But Google added that it does not plan to become a military contractor itself. Instead, my guess is that the company sees the development of physical robots as a natural extension of its core interest in artificial intelligence. Google has been working for years on teaching machines to understand language, make sense of images and videos, and navigate real-world environments. Now it will have a new set of toys—er, tools—on which to test out its machine-learning theories. Boston Dynamics, by the way, is the company’s eighth robotics-related acquisition in the past year alone. From all the press Boston Dynamics’ DARPA bots have gotten, you might think this acquisition would be a big blow to national security. In fact, as I’ve explained before, the company’s robots are a long way from being truly useful in the field. DARPA, like Google, was more interested in using them to learn what is and isn’t possible than to actually aid in any upcoming military efforts. With Boston Dynamics out of play, the field should now be open for other robotics companies to snap up those military-research contracts. Fellow Massachusetts-based company iRobot—maker of the Roomba, but also more advanced projects like the PackBot bomb-disposal robot—comes to mind. 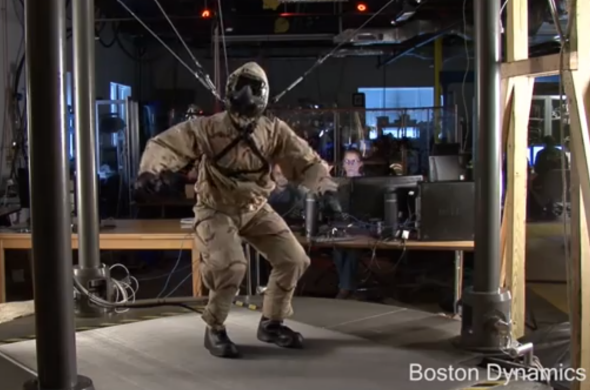 For now, here’s a look at some of Boston Dynamics’ greatest hits, which are now officially GoogleBots—and which may be among the last of their breed.